April Resolutions — How Did I Do? | Finding delight. April Resolutions — How Did I Do? Happy May, Finding Delight readers! This year, I decided to approach my New Year’s resolutions a little bit differently. I wrote out all the months in my journal and have filled in things I want to work on in 2017– 2 items per month. Not every item is filled in yet. I want to give myself space to grow over the year, to not set my resolutions in stone. April Resolution #1. Spring clean my closets and drawers. I don’t know what it is but every Spring I get this terrible, insatiable urge to THROW EVERYTHING I OWN AWAY. Is that weird? Maybe it is something to do with the natural rhythms of the seasons. Hoarding everything away in a little nest during the Winter and then purging once the weather starts to get warmer. Whatever the case, my space starts to feel cluttered. Instead of tossing stuff willy nilly, this year I evaluated what areas needed decluttering the most and focused my efforts. I hadn’t done a proper Kon Mari (ie. throw everything you own on your bed and go through it piece by piece) clothes clear out since moving to Florida and it was high time. So I definitely wanted to tackle my closet and dresser. Organizing my desk drawers has been on my To-do list foreeever, and so has our linen closet. So those went on the list too. The linen closet still hasn’t happened. But there’s always this month! Going forward: Declutter the dang linen closet! Oh, and actually transport those two trash bags that are in the trunk of my car to a donation location. April Resolution #2. Examine spending habits through the lens of happiness. One exercise that really resonated with me asked us to take our bank statement and go at it with three highlighters. Pink, yellow, and green. The pink highlighter was for regrettable purchases. The yellow highlighter was for necessary purchases (like bills and groceries). And the green highlighter was for those purchases that brought about happiness. Since taking the mini-course, I’ve kept up this highlighter rigmarole and have found the visual wildly helpful. And since I had data for the entire first quarter of the year, I thought April was the perfect time to crunch the numbers, evaluate how I did, and decide if there were changes I wanted to make going forward. I pin-pointed a few trends. I got a clear picture of how much I’m spending and on what (as well as if the “what” brought me joy or regret). Alright friends, let’s keep things going in May! How are YOUR New Year’s Resolutions going? Four months down! Tell me how you’re doing in the comments below (#accountability) or feel free to email me – ebeth.berger@gmail.com – if you’d like to keep it private. You got this! I love the highlighter idea. I should do that sometime. My bank offers a way to categorize things online and look at a pie chart, but it’s not always very accurate, especially when your budget each month is different based on pay schedules. I would definitely recommend doing it! My thing is – someone else looking at my spending is gonna see line items like money spent on craft supplies or a random trip to a music festival and think those are places where I can cut. That same person might see my $100 Target purchase marked “clothes” and, not knowing I don’t wear any of it, consider it necessary spending. The only person who can categorize my spending as it relates to happiness is ME. Ahh…accountability. Great job! I seriously need to spring clean! Agh. 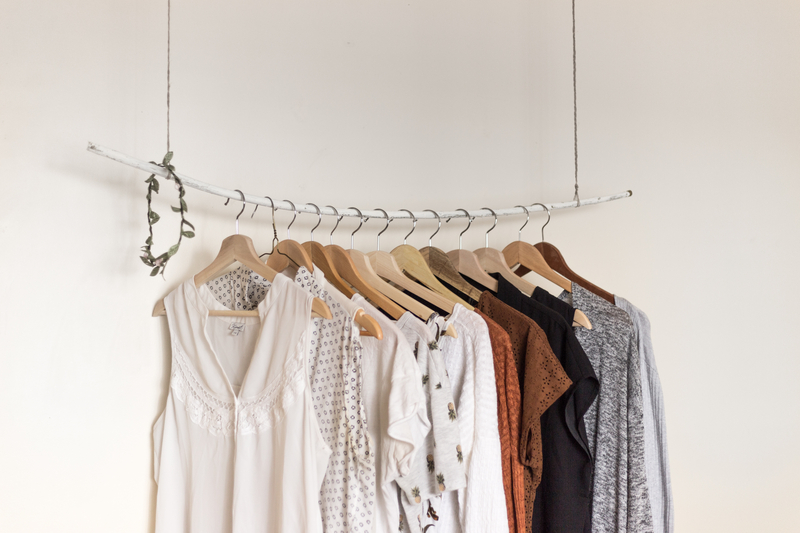 Pingback: 7 YouTube Channels to Check Out For Capsule Wardrobe Inspiration | Finding delight.